Obama administration officials failed to take advantage of opportunities for peace following Israeli Prime Minister Benjamin Netanyahu's acceptance of a two-state solution. Making peace requires bold and creative diplomacy. It calls for courage to question past conventional wisdom and the capacity to look at familiar problems with fresh eyes. In his speech at Bar-Ilan University of June 14, 2009, Benjamin Netanyahu displayed those qualities. Breaking with the Likud Party's conventional wisdom about the connection between the West Bank and the state of Israel, he said that if Israel were to receive guarantees regarding "demilitarization and Israel's security needs, and if the Palestinians recognize Israel as the State of the Jewish people, then we will be ready in a future peace agreement to reach a solution where a demilitarized Palestinian state exists alongside the Jewish state." Netanyahu's acceptance of the two-state solution was a bitter pill to swallow for those in Israel whose religious convictions fostered visions of annexing the West Bank and who saw settlements, both near and farther from Israel's border, as part of that project. He had the statesman's courage to tell the truth to the religious right in Israel that such visions were incompatible with the peace, security and democratic character of the state of Israel. Neither President Barack Obama, then Secretary of State Hilary Clinton nor current Secretary of State John Kerry have responded with comparable courage, creativity and willingness of their own to break with conventional wisdom regarding the role of the settlements as an impediment to peace. Either in 2009 or in the six years since then, they should have seized the opportunity created by Netanyahu's Bar-Ilan speech to transform the meaning of the peace negotiations with the Palestinian authority. Instead, all three failed to grasp the historical significance and political opportunity created by Netanyahu's break with Likud's position . All of them remained mired in the conventional wisdom that viewed settlements, which no longer had any connection to a possible annexation of the West Bank, as an insuperable barrier to peace. U.S. officials remained mired in the conventional wisdom that viewed settlements as an insuperable barrier to peace. As I wrote in a previous blog, after the Bar-Ilan speech, the Jewish settlements on the West Bank now had a different meaning. They were no longer the vanguard of a religiously inspired territorial expansion that precluded a Palestinian state; they were simply places where Jews lived. To be sure, the militant religious settlers saw things quite differently. But now that the right-of-center government of Israel was committed to the goal of a Palestinian state, the settlers faced the option of either leaving that state or remaining and becoming its citizens. A bold, courageous and fresh American diplomacy would have told the world that the only reason that settlements stood in the way of an Israeli-Palestinian final agreement was that the Palestinians were insisting that their state would not be one that allowed Jews to be its citizens. It was Barack Obama's signal failure, as a politician deeply attuned to the nature of racism in American history, to neglect to draw the world's attention to the racism implicit in the Palestinian Authority's position. The President, Vice-President and his Secretary of State all should have declared clearly, again and again, that it was now up to the Palestinian Authority to break with the racism of its own past and welcome the possibility of a Palestinian state that had Jewish citizens—just as the Jewish state has Arabs in its midst. Settlements aren't the vanguard of a religiously inspired territorial expansion that precludes a Palestinian state; they are simply places where Jews live. Just as the state of Israel protects the rights of its Arab citizens, so Obama, Biden, Clinton and now Secretary of State Kerry should have loudly stressed that a Palestinian state would be expected to protect the rights—and lives—of Jews who decided to remain within its territory. Of course doing so would have taken the courage to break with leftist shibboleths that "third-world peoples" could not be racist or Arabs could not be anti-Semites. It would have offended Obama's left and left-liberal base and angered many third-world countries in the UN General Assembly. It probably would not have gone over well with the various academics, journalists and human rights organizations who argued that peace would bloom if only the settlements and settlers would go away. Yet instead of insisting on a single, consistent standard of opposition to racial discrimination no matter what its origins and thus placing Mahmoud Abbas and the Palestinian Authority on the spot, Obama and the State Department decided to make the settlements a central bone of contention in US-Israeli relations. The bitter irony of the erosion of the US-Israeli relationship was that it was Netanyahu, not Obama and his administration, who had displayed the courage to do that most difficult thing in politics — namely challenge the deeply held beliefs of one's own supporters. Obama, Biden, Clinton and now Kerry have all failed to see how Netanyahu had created the possibility of testing the willingness of the Palestinian Authority to break with its past exclusionist and discriminatory definitions of a Palestinian state. By 2014, Obama's White House had sunk to trash-talk diplomacy and gutter language to ludicrously and rudely assert that it was Netanyahu who lacked the courage to make hard decisions. 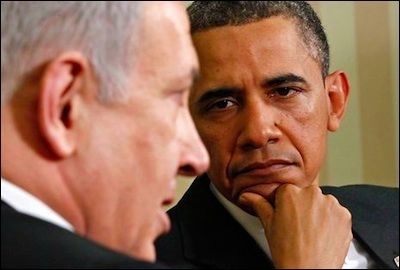 In fact, it was the President who failed to seize the moment created by Netanyahu's flexibility.